Formerly in red silk; now in purple velvet with gilt clasps in dark blue morocco case lettered: Queen Margaret's Prayer Book. Probably executed for Jean III Bethune (ca. 1450-1511) (of the Bethune family whose combined arms are found on fol. 242r and 249v; Théophile Belin (catalogue, 1906, no. 23); purchased by J. Pierpont Morgan (1837-1913) from Pearson before 1913; J.P. Morgan (1867-1943). 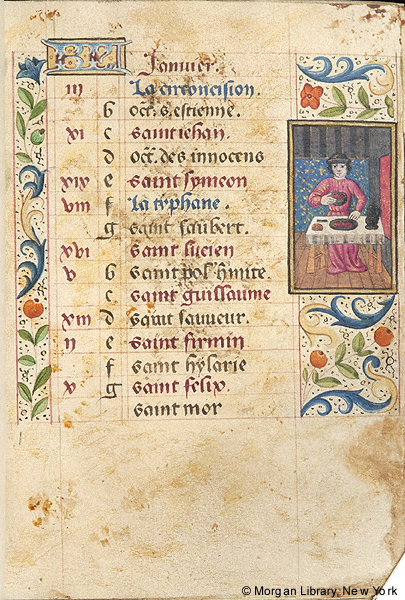 Ms. book of hours for the use of Paris (Hours of the Virgin); written and illuminated in France, perhaps in Paris, ca. 1480. Decoration: 2 full-page miniatures on fol. 242r and 249v; the combined arms of multiple associated families; 44 half-page miniatures with arms of different families at bas-de-page; 8 small miniatures; 24 calendar illustrations.